You are coming up to a one-lane bridge and you see this sign. What must you do? You are coming up to a one-lane bridge and you see this sign. What must you do? Correct. This sign means that traffic coming towards you has right of way. You must stop to let them through. However, you don't need to stop if there's nothing coming, unless there's a stop sign. There are many one-lane bridges in New Zealand, especially in rural areas, and even on some busier holiday routes. 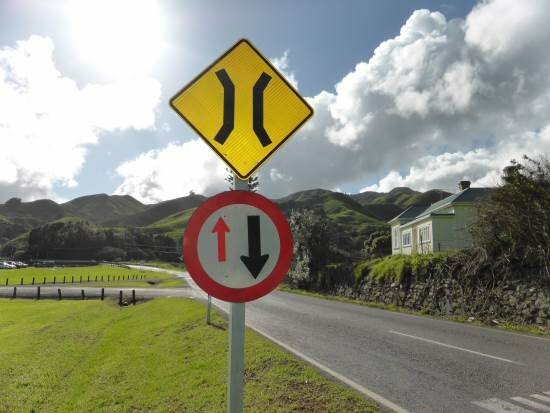 If you are travelling from the other way you will see two sets of signs that will advise you that you have to give way. The following photos are from Waikawau Reserve on the Thames Coast Road (SH25), looking north. 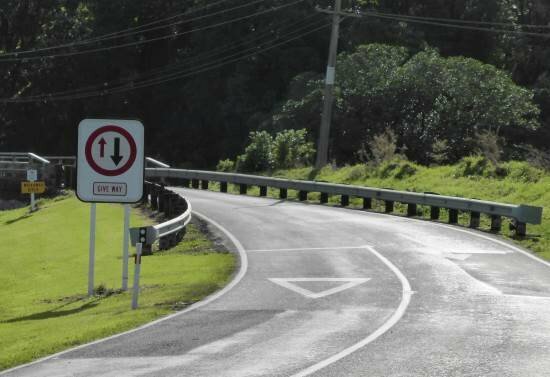 Traffic approaching the one-way bridge over the Waikawau River has right-of-way driving south and sees a sign like the one above; traffic driving north must give way. The first sign advising of a one-way bridge where you don't have the right of way shows a yellow bridge sign plus the red circle showing that traffic coming from the other direction has priority. The second sign, just before the bridge, reminds traffic of the priority. You can also see the white triangle and give way line painted on the road, as well as a road marker and two reflective disks on the barrier on the left. How are one-lane bridges marked? Because you may need to stop when coming up to a one-lane bridge, the traffic markings and signage are important. In the holiday season queues can form at these bridges on some roads. Edge lines form a taper to the bridge from the edges of the seal to the bridge carriageway width. This taper is ideally 50m long. Usually the lines stop when they reach the kerb of the bridge, painted in by about 300mm, unless there's sufficient room to effectively mark and maintain the lines (this is not as probable as the bridge already has restricted width, which is what it's a one-lane bridge). If the approaching roads have a centre line, this is marked up to the bridge, but not on the bridge itself. It's marked to a point where the width of the approach road narrows to less than 5m. There will be a give way line painted on the road with a white triangle. This doesn't have any legal significance, it's not compulsory you stop on the line or even behind the line, it's just a guideline. The give way line will be marked where the road is still at least 5m wide, and preferably 6m. Signs are placed at or before the line. The words ONE LANE BRIDGE are marked on the road. The distance of these from the bridge depends on the speed and type of road. In rural areas they must be at least 120m before the bridge, and in urban areas at least 60m before. The whole phrase is spread over 50m on the road. A single lane arrow can be used to remind drivers to stay on the left as they exit the bridge.